We have been on Summer holidays here for almost 3 weeks now. As always I posted to social media saying just how excited I was to have the kids home now for 6 whole weeks (7 in Harry’s case) and of course at the time I genuinely mean every word of it….AT THE TIME! Fast forward 2-3 weeks and we are a tad stir crazy and getting on each others nerves more than a little – I didn’t plan many activities for the beginning of the holidays as we all needed a little wind down time with no plans of being up, dressed and out of the house by a set time. We have had a good fair share of movie days snuggled on the sofa in our PJ’s until after lunch being more than a little lazy, we’ve done the local free activities within walking distance as Paul uses the car for work during the day – parks, town to the market and lunches out, feeding the duck and play dates, and of course the boring Tesco trips which have cost a lot more than they should as they kids add to the trolley and are both having growth spurts currently and won’t stop eating. Now the kids are a tad bored with each others company and the novelty of no routine has worn off for us all, I’m struggling to get any work done and they want entertaining ALL THE TIME – we have just been away camping and have another holiday at the end of the summer break book, plus I have booked in the car for a few day trips so it’s not like they won’t be having fun. Thanks to Beth, Mandi, Sarah, Emma, Amanda, Jen, Ashleigh, Terri, Susan, Jen, Lucie and Louise for their contributions to this post. 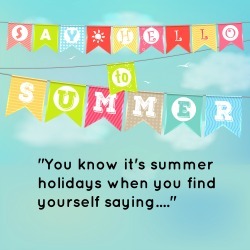 What have you found yourself repeating or saying this holidays? Haha, many of my friends are going through the same thing! They all start off all chipper and full of beans and are now begging for ideas! I don’t have kids myself, but when I spend time with friends’ children I like to create a bit of an outdoor challenge for them e.g. write a list of colours, items and rubbings they can do in the garden and send them out to collect them. Like long leaf, rubbing of wood, drawing of a bug etc. It keeps them going for quite a while and the fresh air tires them out a bit. Oh and it’s free too! Enjoy the final few weeks of the holidays! We got to knitting group on the first Monday of the school holidays and I swear my friend’s head was actually about to explode in front of our eyes. I’ve not seen her for two weeks as she’s been on holiday. Hopefully when she’s back her family are all still in one piece lol. Haha I dread this when Mia is older. You look forward to the summer holiday and within days your bored! I’d welcome any advice for the future! Haha, I think this rings true with us all! Although, in fairness, we’ve had a wicked summer so far and I’m both shocked and gutted that there is only about 3wks left! I am just about holding on – i think moving home wasnt the best during the holidays as the kids want playing with all the time and theres boxes everywhere! I’m very much feeling this, especially after the poor weather trapping us indoors for so long. My kids are not old enough yet for school so I can’t relate about summer holiday, but I do know what it’s like to lose my patience and run out of ideas for keeping them entertained. I can imagine the novelty wears off after a few days. I know I’d love having them home to begin with but I like my own space a little too much.